Asia Ingalls’ bold sterling silver ring is a pretty reminder to follow your heart. Your brain gets a lot of credit. Always thinkin'. So practical! But every now and then, it's OK to put a little faith in your heart. Asia Ingalls wants to remind us all that sometimes, you just have to follow your heart. That's why she created this bold ring. 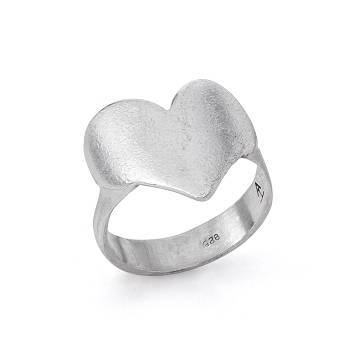 Featuring a large, recycled sterling silver heart that hugs your finger, it's a beautiful way to embrace your carefree side. Handmade in New York City. Asia Ingalls started her career as a painter in New York City. With an MFA in art from Yale and over two decades of experience as a working artist, she’s shown in galleries all across the US and abroad. Active in craftwork education in high schools and trained as a Waldorf teacher, she’s taught woodworking, metal crafting, and jewelry making. Now focused almost exclusively on jewelry design, Asia is making cuffs, rings, and pendants that reflect her fascination with the natural and celestial worlds. Each piece is handcrafted in New York City, where she strives to create designs that embody the true essence of her artistic vision.